Why do birds keep coming back to an empty feeder? I have four birdfeeders at my house that I keep full of birdseed all winter long, but come late spring I stop refilling them until the following fall. I’ve noticed something a bit interesting to me – the birds keep coming all summer long, even though the feeder is completely empty. I will watch the same bird land on the feeder, examine it intently, and fly back to a tree branch 30 or 40 feet away. He will sit on the tree branch for a moment and then fly back to the same feeder and examine it again. This same bird will do this over and over again until I just stop watching…it’s probably doing it right now. Why would a bird continue to waste it’s energy returning to something that is unfulfilling, and completely unsatisfying. It seems that he would realize that this opportunity has dried up, and he could better feed his family searching among the berries and seeds of the field…it’s got to be better than the store bought food anyway. This bird has allowed something that was once a promising opportunity, trap him in a life of mediocrity that will eventually lead to his destruction if he doesn’t make a change soon. 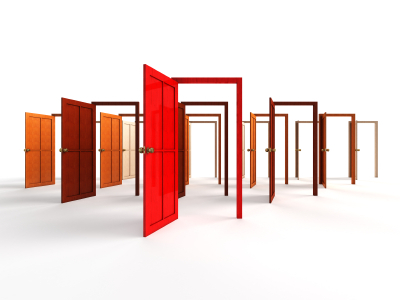 Not every door that is opened for us is the right door for us to walk through, it could even be a trap. I am currently working with a gentleman who is considering a new position with a huge international company. It’s a GREAT opportunity…or is it? Here’s the deal – this move would require that he relocate and leave an area that he loves. This occupation is also 180 degrees from his true passion, which is medical research. But, But, But…It’s a GREAT opportunity, with GREAT benefits, with a GREAT income, with a chance to advance with the company, and probably move around some more. This Is How We Get Trapped! The problem with chasing the wrong opportunities is that they can trap us in a mediocre life, we’ve all heard the saying that Good is the Enemy of Great…and it’s true. We tend to settle for goodness to the point that we miss real opportunities for Greatness! When we pursue the wrong opportunities it’s kind of like boarding the Titanic…it looks so promising, but in the end it is so destructive. We long to be free and live the life we were born to live, and until we are, we are not really living fully alive. Know Yourself…Understand what you’re Passionate about, and what it is that you Value most. Uncover your Personality traits, Do you like to be around people? Do you enjoy a fast paced life or prefer a little more relaxed pace? Are you a big picture thinker, or would you rather focus on the details? Determine your Skills and Abilities. Evaluate Every Opportunity…Run every opportunity through the filter of the answers to item #1. Is it an opportunity you’re passionate about, and does it align with your Values? Does it lend well to your Personality? Do you have the Skills and Abilities to carry out the functions of this opportunity with Excellence? Will it meet the needs of your Family…Financially, Socially, Spiritually, Enviromentally, and Relationally? If you Evaluate every opportunity against these criteria, you are well on your way to Avoiding the Trap, and being more Intentional About Your Legacy.